Here’s how to make sourdough bread in your bread machine. You need to make sure your machine has a setting that will allow a few hours of rising (ideally 3 or more) without kneading it in between. Don’t set your machine to knead it more than once. It’s ok for up to 3 days out of the fridge, then it needs replenishing. To replenish, put starter into a clean bowl, add one cup of water that’s a bit warmer than lukewarm, and one cup of flour (can use any flour – I use wholemeal). Mix well, cover, and leave it to sit (doesn’t have to be in a warm place). The leaven is ready to use when it’s bubbly – can take a few hours. The first few times put it in a glass bowl or jar so you can actually see the bubbles. When you make bread, use the amount of leaven specified in the recipe, setting aside some to replenish for the next loaf, and then straight away replenish the leaven. When you replenish you can use as little as half a cup of flour and half a cup of water if you feel you have too much leaven. 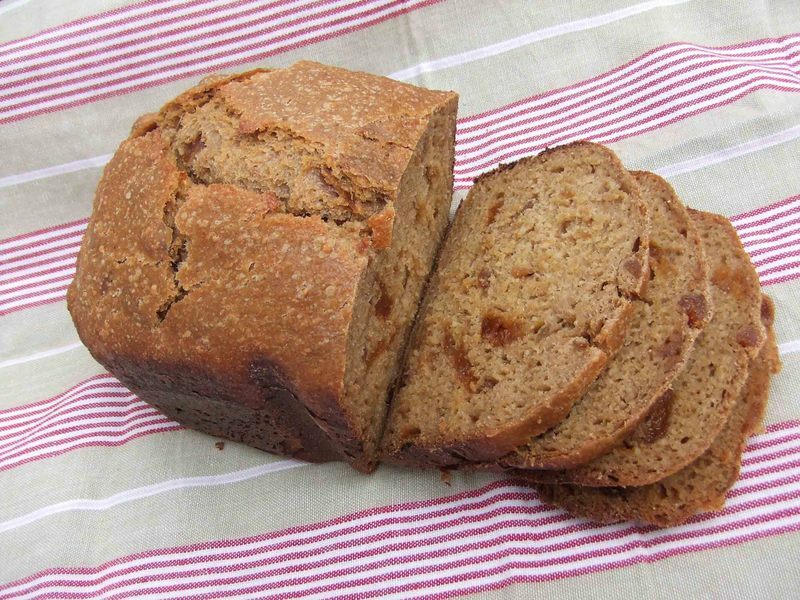 You need to replenish every 3 days if you haven’t made any bread, or you can put it in the fridge, and take it out and replenish several hours before you bake a loaf. If you are only baking one loaf a week you might need to chuck out a bit of leaven when you replenish it so you don’t end up with a vast amount. The longer a leaven has been sitting since it was replenished, the more sour it will be. So for a sour bread, replenish the leven 24-48 hours before you bake. For a mild bread replenish leaven a few hours before you bake. You will notice in the first 48 or so hours after you replenish the leaven it seems to grow and bubble wonderfully, and then it sinks back down – don’t worry, it’s not dead, it just needs to be fed again (replenished). If the leaven goes off or has black water on the top or is mouldy, scrape off the bit that’s gone bad, rescue a tablespoon or so of the good stuff from underneath, and replenish that. To make the leven, the morning before, I feed the leven: 2 tbsp leven, half a cup of flour, half a cup of water, mix, leave on the bench. On the morning, put 1 cup water in a bowl with the leven, add 2 tsp salt, mix, and then mix in 3 cups flour. Mix well for about 3-5 mins. Now for the kneading process. It’s possible to make no-knead bread, but when I did one loaf without kneading, and the other loaf kneaded I was amazed at the difference: the kneaded loaf rose beautifully and had much better texture. The unkneaded loaf was quite dense by comparison. Once you’ve done the above mixing of ingredients, rest the mixture for 20 minutes. Knead for 5 mins. It’ll probably be an impossible sloppy mess. Just scoop it up with your hands repeatedly and throw it down on the bench. Fold it over if you can and just let it be sloppy. The more moist it is, the nicer your bread will be. Knead 5 mins. It’ll be holding together better now – much smoother. If it’s too dry, work in more water by wetting your hands as you knead. If it’s still impossibly wet, add more flour. Shape it by stretching into a rectangle, rolling up like a Swiss roll, then, optionally, roll it in some seeds. Place in your tin, cover with a shower cap or damp towel, and leave in a warm place to rise. It takes mine 4-6 hours to rise, depending on temperature. If it’s really cold, rise it in an esky with a hot water bottle for company. Preheat the oven to 250 degrees celsius, put in the loaves and bake for 10 mins, turn it down to 180, and bake for another 30 mins. Turn the bread out onto a rack to cool. 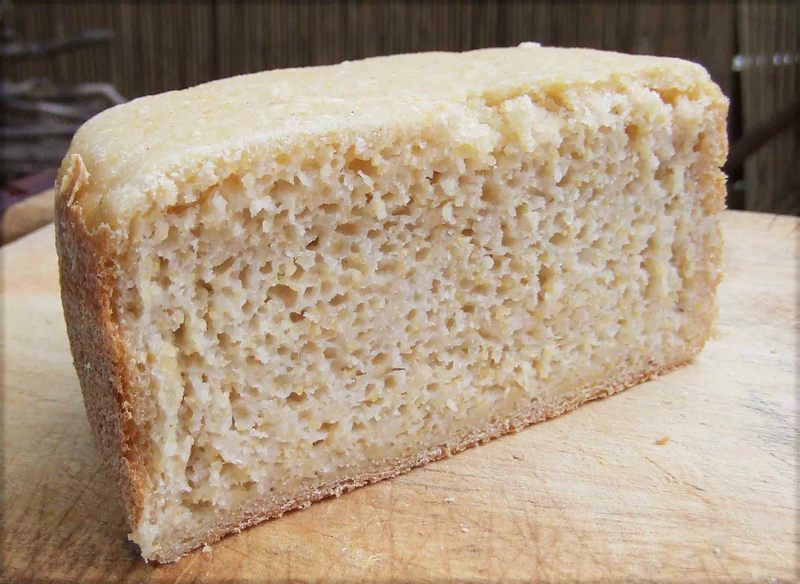 This is a gluten-free Rice and Polenta loaf with an amazing moist texture like crumpets. I wanted to make something like the one Sol Breads make up in Brisbane, and I tried for ages to get their recipe, but no go. I experimented till I got this bread and I’m really happy with it. The bread is a bit sticky when it’s hot so cut it with a wet knife if you can’t wait for it to cool. If you have a bread maker cook it on the basic setting. If not, mix the ingredients in a bowl for up to twenty minutes (or only five or ten if that’s all you can be bothered to do), tip it into an oiled bread tin, let rise overnight (or all day) then bake for about an hour at about 200 degrees centigrade. I’ve tried a zillion different fruit loaf recipes and this is the winner by a mile. It’s so moist and sweet and yummy, and it’s even pretty healthy. If you have a bread maker cook it on the wholemeal setting. If not, mix the ingredients in a bowl for up to twenty minutes (or only five or ten if that’s all you can be bothered to do), tip it into an oiled bread tin, let rise overnight (or all day or for at least 4 hours) then bake for about an hour at about 200 degrees centigrade. I’m a die-hard wholegrain cook and I only occasionally add white flour to my bread. But to please Paula I made her this white loaf and it was so exquisite I couldn’t believe it had taken me so long to try it. This also serves as my basic sourdough recipe – substitute spelt, kamut, wholemeal wheat or any combination of flours you like. If you have a bread maker cook it on the basic setting. If not, mix the ingredients in a bowl for up to twenty minutes (or only five or ten if that’s all you can be bothered to do), tip it into an oiled bread tin, let rise overnight (or all day or for at least 4 hours) then bake for about an hour at about 200 degrees centigrade.